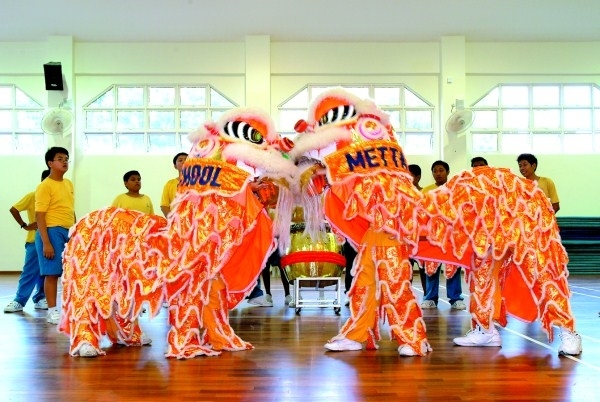 Since its establishment in Year 2003, Metta School Lion Dance troupe, comprising both the alumni and new members has grown in skill and popularity. The troupe practices once a week under the supervision and guidance of a dedicated instructor. Appointed student leaders also play their part to impart the fundamentals of this performing skill. It is heart warming to note that Lion Dancing also attracted students from diverse ethnic groups. The pupils from different cultural backgrounds are encouraged to work together to improve their moves and coordination skills. As the activity emphasizes on cooperation and patience, we hope to inculcate the importance of unity, team work and self-discipline to the troupe members. Lion Dance is a form of traditional Chinese dance in which performers mimic a lion’s movements in a lion costume. Lion Dance performances are usually associated with joyous or auspicious social and festival occasions like opening ceremonies and Chinese New Year. Lion dancing which symbolizes the spirit of unity and joy is revered not only in Asian countries but is also promoted by the Western countries that are fascinated by the spirit of solidarity and energy displayed in Lion Dancing. Our Lion Dance troupe is thankful to the various organizations and benefactors (especially Metta Welfare Association) who had on many social and festive occasions commissioned our Lion Dance troupe to perform and showcase its skill and talent.